Europeana Research recently hosted a guest blog post by Beatrice Alex, Research Fellow at the School of Informatics at the University of Edinburgh and a member of the Edinburgh Language Technology Group . Beatrice describes her ‘Wish List to GLAM’ for providing access to data for text mining and we thought this might be of interest to the broader TDM community. Beatrice has been part of several digital humanities projects using TDM, including Trading Consequences and Palimpsest, which used different textual sources from archives and libraries. 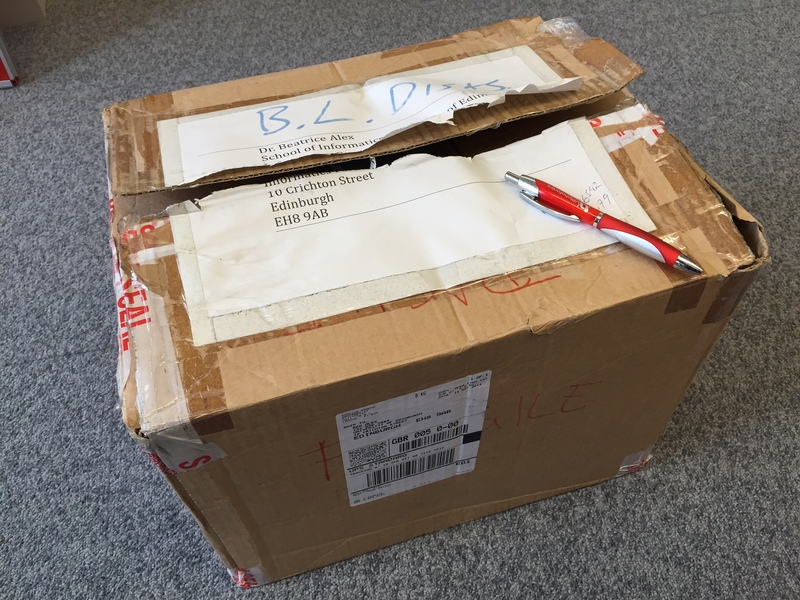 An illustration of the life of a researcher using TDM: Beatrice’s delivery of the British Library Nineteenth Century Books Collection on hard disk for the Palimpsest project. While many technical barriers impact TDM, one highlighted issue in this discipline is finding out about resources in order to access them. Beatrice goes on to describe her experiences in different projects with obtaining legal permission to mine, accessing data in various formats from hard disks of scanned book images to excel spreadsheets and attachments to well-structured APIs. Data formats are also challenging to navigate but with enough documentation a great deal is possible. Beatrice wrapped up with a wish list for GLAM institutions interested in sharing their data for TDM and we thought this was well worth sharing with a wider group of TDM practitioners, content providers and other stakeholders.